You may have thought about working in a business that allows you to work with other businesses instead of the general public. There are many benefits to working in an industry in which this is the case. First of all, there is the benefit of having a client list that is made of fewer, but repeat clients of other businesses. When this is the case, you will find that your work becomes more about building relationships with certain clients, rather than having to start essentially fresh with many new clients each day, of which there are more, but who deal in smaller transactions. Working in the business to business industry has other benefits in addition to building lasting relationships with clients who are also interested in maintaining a good relationship with you. Working business to business also means that you will only have to work during business hours during the week, with no weekends, evenings or holidays required of you. A sign company that deals with business signage, retail signage, etc is one such example of this type of industry. Sign companies typically deal with shorter client lists of businesses, who regularly order new signs for new promotions, products, services, locations, and more. Every business needs to keep their signs updated to maintain themselves, so building good relationships is both a must, and a pleasure in the industry. An option to consider when shopping around, deciding where to invest in your future, is a Sign World franchise. There are many benefits to starting up a sign company in addition to those listed above, and it is a relatively easy business to get started, and then to maintain and grow, especially with the help of the Sign World headquarters to guide you along the way. Sign World does so much more than just help its franchisees get set up, though we do a wonderful job of ensuring that that part of the process is done well too. With all of the start up expenses included in your initial investment (including an extra sum to ensure a security net in case of a difficult period financially or other unforeseen circumstances), there is little to worry about in the early stages of the process as you become established. Sign World does not stop helping each of its franchisees once they are ready to do business. We ensure that each and every one of our owners gets regular training and ongoing support to make sure that they are always prepared to take on the intricacies of managing a Sign World franchise. Sign World provides weekly and yearly specialized training that covers all aspects of handling your business, from marketing to day to day operations. Starting a sign company with Sign World is a low risk, easy way for you to start a successful business. 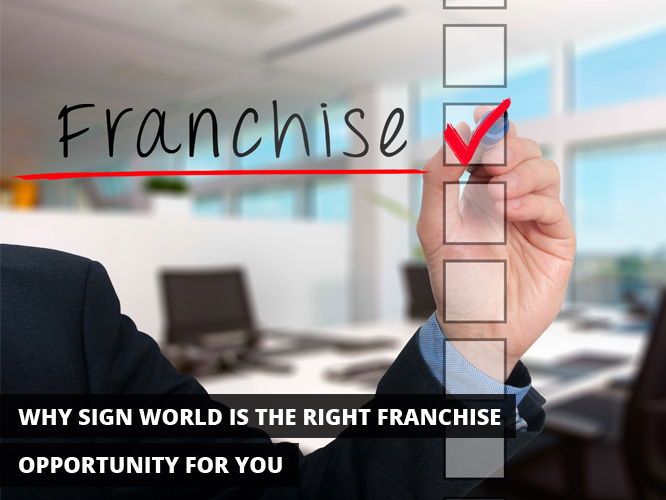 Sign World has been operating for 25 years, and thus has the experience and expertise to ensure that you have a successful franchise. They are there to support you every step of the way, from the initial start up to, if you choose to, the eventual selling of your business at a profit. To take the next steps towards becoming a proud owner of your own Sign World franchise, check out our main page for all the details.